A recent trip to the mighty Amoeba Records highlighted a couple of useful facts. Unfortunately there is less and less reason to go to an actual record shop these days. 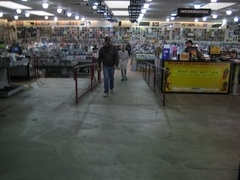 Where I would have once whiled away a solid day flipping through albums for imports, rarities or new releases ("a new My Morning Jacket album, I had no idea! "), the internet has pretty much rendered that lack of pre-information obsolete. Not much slips out these days without a mammoth, self perpetuating viral marketing campaign.